Heat oven to 375°F. Spray large cookie sheet with cooking spray. 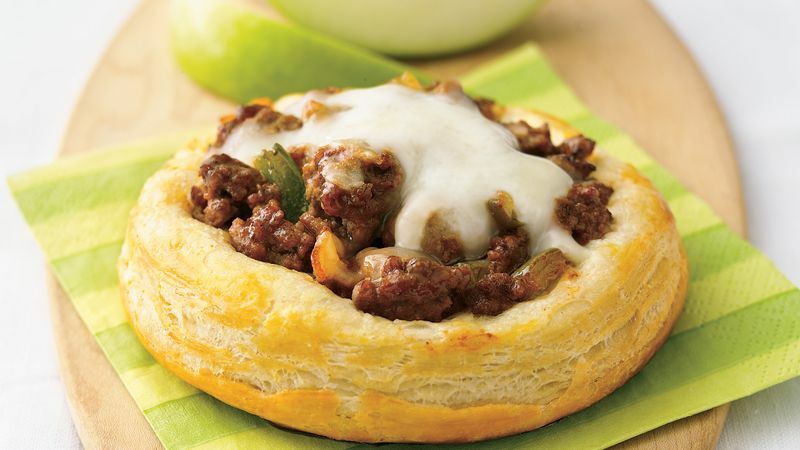 In 10-inch skillet, cook beef, onion and bell pepper over medium-high heat until beef is thoroughly cooked; drain. Stir in ketchup, mustard, Worcestershire sauce, salt and pepper. Separate dough into 8 biscuits. Place 2 1/2 inches apart on cookie sheet. With bottom of flat 2-inch diameter glass or fingers, press out each biscuit to 3 1/2-inch round with 1/4-inch rim around outside edge. In small bowl, beat egg yolk and water with fork. Brush over tops and sides of biscuits. Spoon about 1/3 cup beef mixture into indentation in each biscuit. Sprinkle each biscuit with 1 tablespoon shredded cheese. Bake 12 to 17 minutes or until biscuits are golden brown and cheese is melted. Serve these satisfying biscuit rounds with a salad of mixed greens and glasses of cold milk. Originally developed in India, Worcestershire sauce was first bottled in Worcester, England. This condiment usually includes garlic, soy sauce, onions, molasses, lime, anchovies and vinegar.